A festive holiday poundcake topped with a delicious vanilla custard pouring sauce. 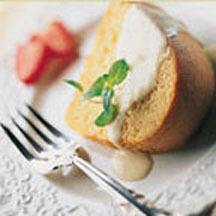 For Pound Cake: Combine eggnog, eggs, cake mix, butter, nutmeg and vanilla in large mixing bowl. Beat with electric mixer on low to blend ingredients. Beat on medium for 2 minutes. Spoon into a greased-and-floured fluted tube pan and bake in a 350°F (175°C) oven for 40 to 45 minutes. Remove from oven; cool in pan on wire rack for 10 minutes. Carefully invert over cooling rack and complete cooling. To serve, slice and serve with Pouring Sauce. For Pouring Sauce: Beat together egg yolks and sugar in small bowl with electric mixer until the color of the yolks has lightened (2 to 3 minutes). Set aside. Whisk together milk and whipping cream in heavy saucepan over medium heat; bring to a boil. Gradually whisk boiling mixture into beaten yolks. Return mixture to saucepan and cook over medium heat, whisking constantly, until mixture coats a spoon. Do not let boil. Whisk in salt and vanilla. Cool completely. Serve sauce with cake slices.